What's coming up in the world of minor league baseball ... we proudly give you Rick Chandler's Minor Enterprise! Your team may don camouflage uniforms with our boys in the military in mind, but not the Kansas City T-Bones. The Independent Northern League squad has opted for a hunting theme this weekend, and their motto will be safety first, as one can see by the bright orange caps and sleeves in our photo here. Yes, it's Redneck Weekend at CommunityAmerica Ballpark beginning tonight, and the T-Bones will be loaded for bear, or squirrel or whatever, in their set with the Winnipeg Goldeyes. One feature of the weekend: Injured players will not be placed on the DL, but instead darted with a potent tranquilizer and relocated further back into the woods (a big thank you to the U.S. Forest Service!). More on Redneck Weekend, plus the winner of the Worst Song in the World competition and the majesty that is Potato Night, following the jump. Tonight: Mullet Night (half-price admission to all those with the Canadian Neckwarmer), plus Director of Group Sales Brandon Smith will be getting a mullet haircut between-innings on top of one of the dugouts. There will also be a mullet contest. Saturday: Redneck Wine & Cheese Festival; a benefit for the Kansas City Cancer Center. A $5 donation gets you two glasses of Franzia and all the Spam, Twinkies, spray cheese and crackers and Slim Jims you can eat. Sunday: The Redneck Olympics. Three teams of two people each will compete all game long to find out who is the biggest redneck in Wyandotte County. Competitions will include road-kill pickup, corn huskin' challenge, a watermelon crawl, and many others. That's corn huskin', not corn detasslin', Will. • The Amazing True Story Of Left Field Louie. One of my favorite logos in all of sports is that of the Joliet Jackhammers (Independent Northern League). But even greater is their star attraction at Silver Cross Field; the gigantic statue of Left Field Louie. It may interest you to know that Louie started out selling mufflers just outside of Minneapolis, Minn., before he was optioned to the Jackhammers to achieve professional baseball fame. Learn the inspiring origin story of Left Field Louie right here, and don't be ashamed if the tale moves you to tears, or at least causes minor redness and swelling. • Worst Music In The World Update. Long Beach Armada (Independent Golden League). You may recall that throughout the month of June, the Armada asked fans to vote for the worst song ever; an exercise which drew thousands of votes from all over the nation. The result? Apparently the Worst Song In The World is We Built This City, by Jefferson Starship; a worthy choice (I hear they were using it at Gitmo before Congress put its foot down). Fans were serenaded by all the "winning" songs during an Armada game on June 23, and the roster of badness can be seen below. Good luck getting these songs out of your head. • Potato Night. Friday, July 6. Idaho Falls Chukars (Rookie Pioneer League). If you can attend only one promotional event this season, it might as well be Potato Night ... and we don't even know exactly what's going to happen. What we do know: The Chukars are breaking in a brand new, $6 million stadium, and Idaho is very serious about its potatoes. If I could be assured of a potato-costumed mascot, I would attend myself. • Ripley's Believe It Or Not Night. Tuesday, July 10. 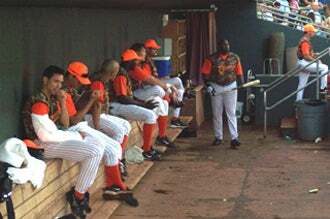 Greeneville Astros (Rookie Appalachian League). On this special night, hot dogs are only one dollar ... Believe It Or Not! • Beat The Heat Tuesday. Tuesday, July 10. Fresno Grizzlies (Class-AAA, Pacific Coast League). Any Tuesday that the game-time temperature exceeds 100 degrees, the Grizzlies will deduct 50 cents from every field level reserved seat ticket for every degree over 100. It was 104 yesterday, by the way. Of course it's also Tecate Taco Tuesday, where delicious tacos are $2 each, so there go your profits. • Redneck Night. Thursday, July 12. West Virginia Power (Class-A South Atlantic League). The outhouse races alone are worth the price of admission. • Bobblehead Of The Moment. Nora Roberts Bobblehead Day. Friday, July 6. Hagerstown Suns (Class-A South Atlantic League). Your son's bobblehead collection will not be complete without this item, which depicts the author of romance novels such as Affaire Royale and Brazen Virtue. And Ms. Roberts will be there in person, so you can finally get that copy of The MacGregor Brides autographed. We want your minor league tips! Send all stories, photos and muffler poetry to RickChand@GMail.com.